Narryna’s collection of 19th and early 20th century costume and dress has been identified as nationally significant and has received funding through the National Library of Australia’s Community Grants Program. The collection includes approximately 450 gowns and over 1,000 accessories. This rare collection includes: men’s dress items, working clothes, underwear and a range of support materials including 19th century fashion magazines. A cotton day dress worn by Mrs Sarah Butler (1787-1870). Sarah was the wife of lawyer and pastoralist, Gamaliel Butler (1783-1852) and lived at Stowell, a house neighbouring Narryna. In 1856-57 her son, Charles Butler, rented Narryna to be near to his mother. According to family oral history, the dress was worn by Sarah on her arrival in Van Diemen’s Land in July 1824. This sense of the dress’s date may have related to the roller-printed cotton’s ‘Regency stripe’ pattern. The cut of the dress, however, suggests c. 1842. The majority of costume surviving from the early 19th century relates to formal occasions. This item is a remarkable survival as a cotton dress, almost certainly home-made for wearing at home. The fabric has been pieced to use all available remnants and the dress has been repaired over time. 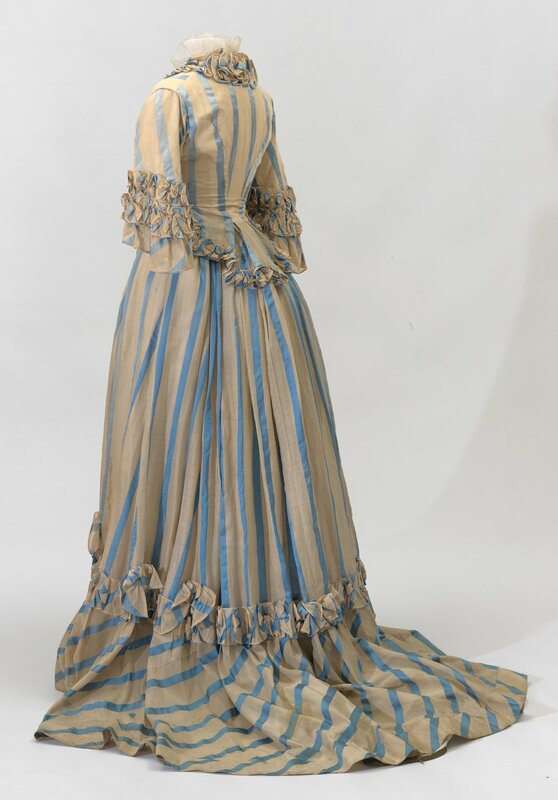 The dress was worn by Sarah’s descendants in early 20th century costume tableaux, indicative of the Butler family’s sense of its role in Hobart’s foundation. A summer dress for a woman with a statuesque figure. The dress’s cream or ecru muslin is interwoven with a blue sateen stripe. In a French Second Empire emulation of Louis XVI styles, the pointed bodice with half-length sleeves is trimmed with rouching and bows. The Walker family costume collection is a truly rare and significant record of early Australian dress as seen through a Quaker prism. George Washington Walker, Sarah Benson Walker and eight of their ten children lived at Narryna in 1852-54. Members of the Religious Society of Friends (also known as Quakers) adhered to a design philosophy that valued simplicity. Quaker women’s dress used plain fabrics in subdued colours and avoided personal adornment such as ruffles, lace and other forms of ornamentation. Quaker families such as the Walkers and Mathers were drapers, hence the high quality and durability of the fabrics used, with exquisite needlework. These dresses date from c. 1840, although Quaker women used the same patterns through to c. 1915.